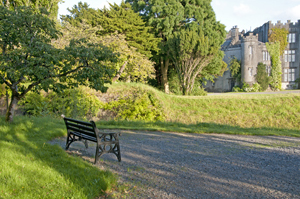 My wife, Diane, and I stayed in a cottage on the grounds of Birr Castle in the Irish midlands during August and part of September, 2010. 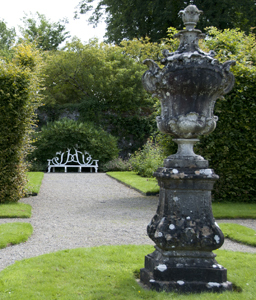 We were blessed with excellent weather for the most part, and the grounds and gardens put on a grand show for us in the ever-changing dramatic light of the Irish summer. 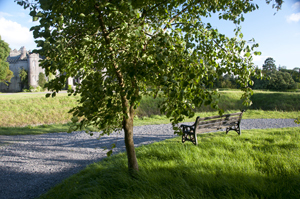 This is a collection of panoramic images taken from 18 places around the Demesne -- all but one of them from benches -- which attempt to show some of the beauty a visitor can find in that place. 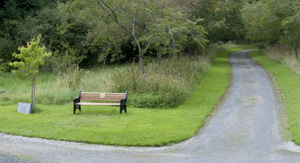 If you click on an image of a bench below, you will be taken to a page that generally contains three large images: one of the bench itself, a small version of the panorama of images taken from the bench (such as the one above,) and one snapshot of a detail in the view from the bench that caught my eye. 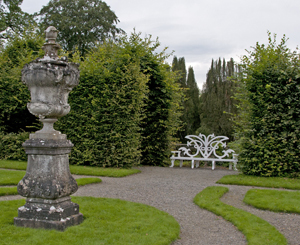 This project was inspired by Canadian artist Margaret Ryall, herself a "veteran" visitor to the Birr Castle Demesne, who evoked a marvelous sense of the place in a series of works recently completed, each melding fine details from various views into a coherent whole. (Please see the "Reading a Garden" section of her online gallery to see images of some of those works.) The detail images here are a salute to her. All images © Sherwood Harrington. No use is permitted without permission. Technical information about the panoramas, such as angular field of view, number and orientation of constituent frames, software used, and photo equipment employed is available by request. Bench 1: Near the carriage entrance at Oxmantown Mall. Bench 2: Near the Science Centre. Bench 3: Around the great Blue Atlas Cedar near the suspension bridge. 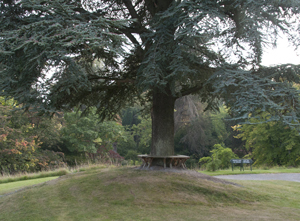 Bench 4: Near the cedar, with its back toward the Camcor. 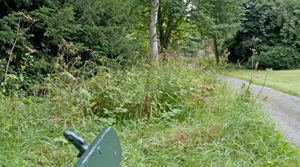 Bench 5: On the South end of the lake. 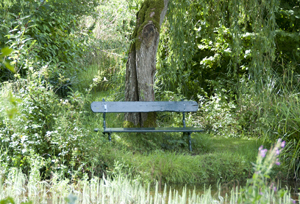 Bench 6: Near the South end of the lake. 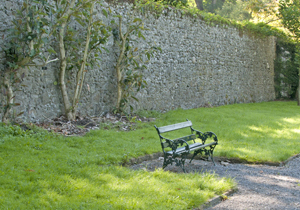 Bench 7: Backing against the East wall of the Millennium Gardens. 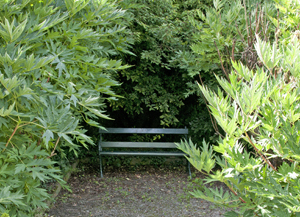 Bench 8: Nestled in the Paeonia 'Anne Rosse' just North of the glasshouses. 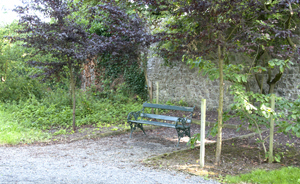 Bench 9: Across the 1643 brick bridge on the Tipperary side of the Demesne. 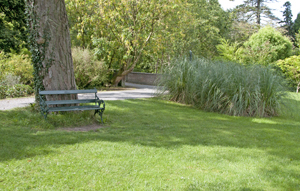 Bench 10: At the west side of the Millennium Gardens. 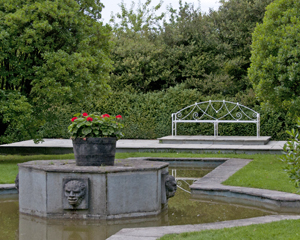 Bench 11: Behind a fountain just West of the formal gardens' glasshouses. 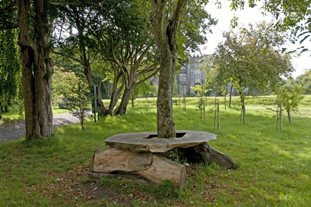 Bench 12: Looking across the dry moat toward the castle. Bench 13: Same structure as Bench 2 above, but looking the other way. Bench 14: At the dry moat near bench 12, but with a different perspective. 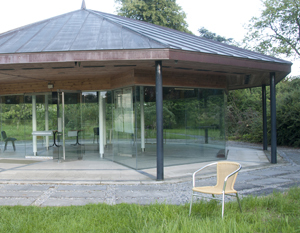 "Bench" 15: Near the display pavilion by the great telescope. 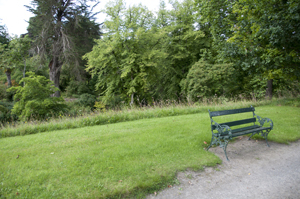 Bench 16: First of two benches facing westward from North of the formal gardens. 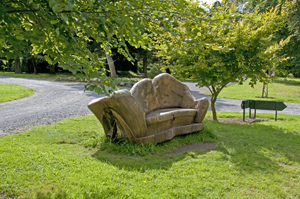 Bench 17: Just a few paces North of Bench 16, but with a very different view. 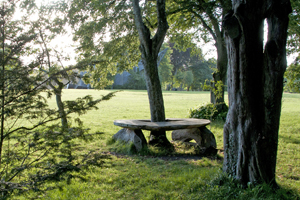 Bench 18: In the far northern reaches of the Demesne near the Croghan Lodge. 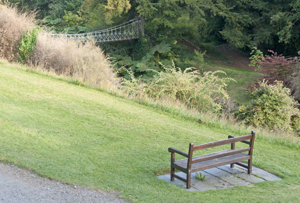 Bench 19: At the suspension bridge over the Camcor.